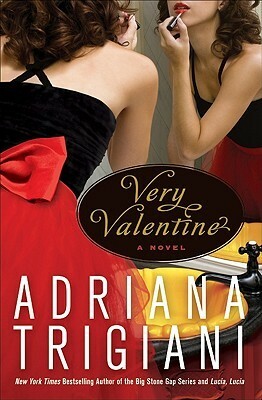 Very Valentine is our book club book for the month of October. We have read a couple other of Adriana's books. Milk Glass Moon and Home To Big Stone Gap. She's an Italian writer and always incorporates a lot of her culture into the stories. My step dad is Italian so it's kind of fun to hear somethings that remind me of him, his mom, and their family. There was one part where she described a hand movement and my step dad totally does that. Who knew it was an Italian thing! So the story is about Valentine, who is getting sooo old (almost 34! really!) and is the only one in her family that is not married. She also lives with her Grandmother in their shoe shop. Valentine and her Grandma make custom wedding shoes, a family business that has been going since 1903. But along with Valentine's eggs the business is on borrowed time. Valentine's brother wants to sell the business and the building (which is worth a lot of money) and thinks it's time for Grandma to retire. Valentine is determined to make the business over. Also throw in Roman, who is a busy chef and Valentine's new boyfriend. It's a story of learning, loving, and a lot of hard work. In the Goodreads reviews a lot of people thought that there was an overload on the descriptions but it didn't bother me at all. I felt it just helped me to see the whole picture and I really would like to go to Capri some day! I'm glad you enjoyed the book... I often get frustrated if there are too many descriptions in a book. Not Quite A Day Off But I'll Take It!